When the App Store launched in 2008, it provided developers with a marketplace through which they could directly engage with users without any need for interacting with the manufacturers of mobile hardware. Prior to the App Store, getting an app onto a phone required (typically very time-consuming) negotiations with OEM suppliers to have that app pre-installed on select hardware. The App Store alleviated the need for that: the App Store disintermediated the distribution process for the iPhone (with all Android OEMs soon to follow through Google Play) by creating a direct-access marketplace between end users and developers, removing the gatekeeping function from the OEM. The stunning rise of streaming video on mobile. Video is now one of the dominant forms through which content is consumed on mobile, stealing attention away from televisions in the case of cord cutters or, in the case of cord-nevers, existing as the first and only format through which network-quality video content is consumed. The rise of streaming video has come at the expense of other forms of mobile content: the thawing of the grossing chart — in which gaming apps, which exclusively and consistently dominated the top 5 grossing positions for years and are now all but absent from that range — showcases how consumer engagement on mobile has changed in the past year. 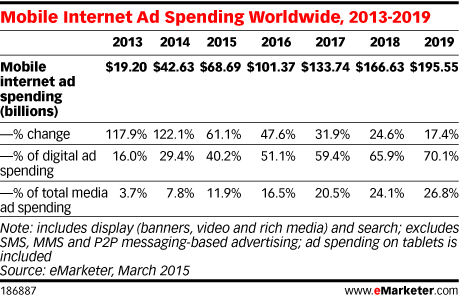 The explosive growth of mobile advertising, which is the primary means through which app developers build audiences on mobile. Mobile advertising inventory is not only stealing budget from the desktop web, but, because of the growth of streaming video on mobile, it is also stealing budget from television, enticing brands onto a much more transparent, performance-oriented advertising ecosystem. The saturation of the app economy to the point at which most extant consumer use cases are covered by successful apps that have effectively either won the market or settled into an oligopolistic dynamic, with a small number of apps capturing the majority of the market (eg. Uber / Lyft, travel, dating, etc.). This trend dovetails fairly logically with the second trend, as discovery has become a function of marketing budget and only the richest apps are able to grow their audiences amongst the millions of participating apps in the app economy. 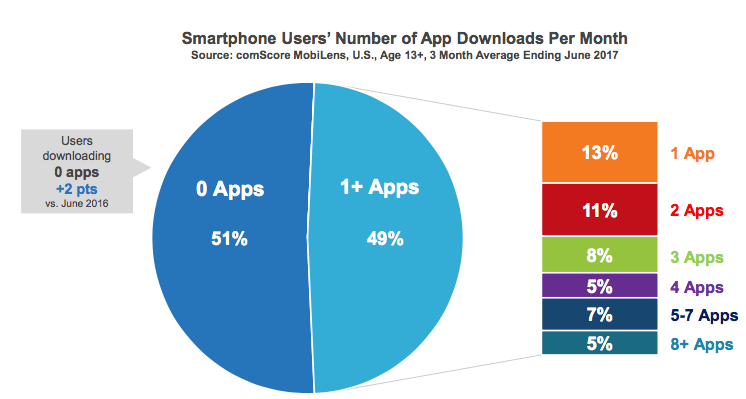 At this point, most users download no or very few apps each month. These three trends have created a growing tendency of the operators of the largest mobile properties to build catalogue and discovery mechanics into their apps, effectively becoming app stores within app stores. The highest profile case of this is probably Facebook’s Instant Games, but if the definition of “app” is loosened and abstracted, instances of this can be seen across the mobile spectrum. At the MWC Americas conference in late September, I gave a presentation in which I described this phenomenon and exemplified it with the Netflix app: as a popular legacy service from Desktop (and before that, the mail), there are very few people discovering Netflix for the first time in the developed world. Yet Netflix is driving an impressive amount of revenue on mobile, and much of that revenue comes from third-party content that was developed exclusively for its platform. A great example of this is the show Narcos, which can be discovered from prominent placement within the Netflix app and is one of its highest profile properties. 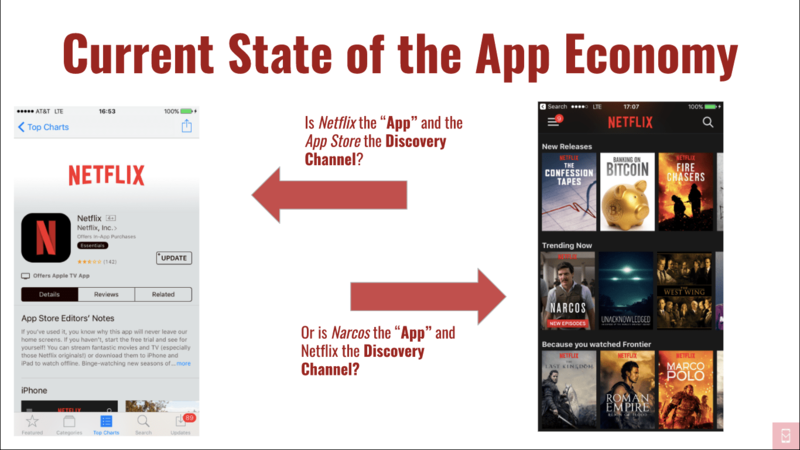 As a participant in the app economy who has subscribed to Netflix for almost 10 years, discovery as it relates to video is not happening for me in the app store anymore but rather in the Netflix storefront. Similar cases can take place within the context of Facebook Messenger Instant Games, or in the iMessenger app store, or YouTube, or with retail in Instagram, or with gaming streams in Twitch, or with videos on Facebook Watch, or even in Google Maps (with options to launch Lyft and Uber for directions searches). Again, if the concept of the “app” is abstracted away to mean some discrete piece of content consumed on mobile, then a person might never download an “app” through the App Store / Google Play yet still interact with new “apps” that were discovered via mobile, app-based content channels on a monthly or even daily basis. In other words: discovery has shifted downstream on mobile from the app stores to the largest content channels. This has consequential implications for many participants throughout the mobile ecosystem. 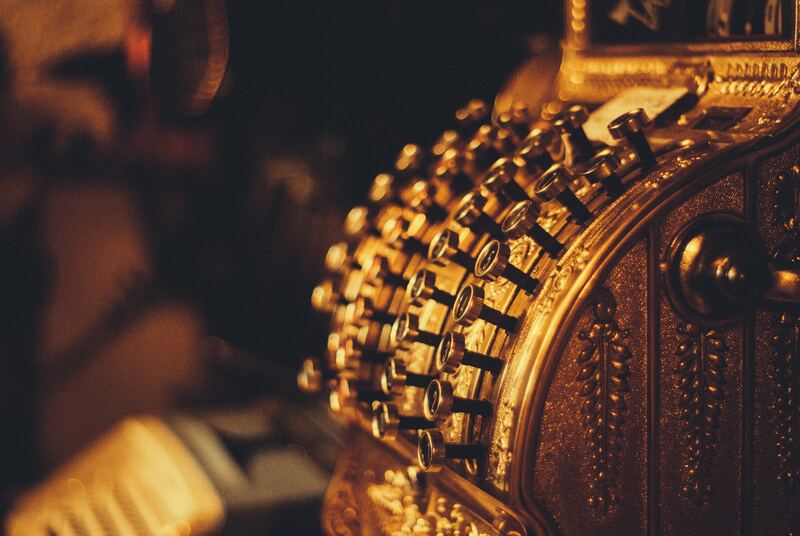 For content creators, it means that loyalty to / partnerships with a specific content distribution channel that operates across platforms might make more sense than creating content for a specific platform if distribution is a major consideration or limiting factor. For marketers, it means that the universe of relevant inventory on mobile has increased and will likely continue to do so: when the definition of app is relaxed, mobile app install ads stop being the only effective means of promoting apps. And for the platform operators, Apple and Google, it mean striking a careful balance between control over their ecosystems and fostering an environment that’s friendly and attractive to developers. Apple, in particular, is navigating this reality with care. With iOS 11, Apple introduced an impressive number of new editorial showcase settings into the App Store to aid with discovery; it also de-emphasized the Top Downloaded chart and removed the Grossing chart from the App Store altogether. These are important changes in a precarious situation, and Apple did a good job in traversing them, but tensions between the largest content channels and the platform operators may yet come to the fore.